We're now about three weeks into the upgrade of Cycle Superhighway 2, the long-term aim being to replace a stripe of blue paint with something segregated and safer. 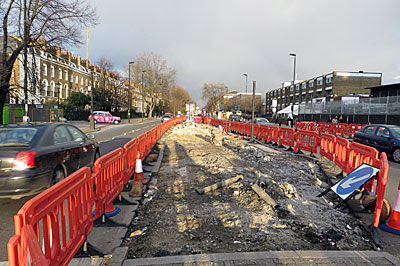 As part of the fifteen-month upgrade things will get much better for cyclists but worse for pedestrians, and during the works period alas worse for both. 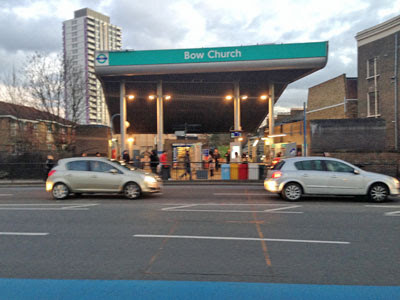 Bow Road is a busy trunk road, about a mile long, linking Mile End to the Bow Roundabout. There aren't many major road junctions along its length, with only those at Campbell Road and Fairfield Road being signal controlled. A broad road, with two lanes of traffic in each direction, it can form a barrier to local pedestrians trying to get around. Those of us needing to cross Bow Road on foot have a choice of nine pedestrian crossings spread out irregularly along its length. I've labelled these from [A] to [I] on the map, and thankfully all are staying as part of the CS2 upgrade. But there's also a fair amount of central reservation, intermittent and unbarriered, allowing the fitter of us to dash to the middle through any gaps in the traffic and then wait again to dash to the other side. And much of this is going. It's being removed to make more room for a proper segregated cycle lane on either side of the road, so it's being sacrificed for a good cause. But the end result is going to be fewer opportunities to cross, lights that stay red for longer, and more pedestrians dashing across in less safe places. [A] TfL are making some whopping changes at the junction of Burdett Road, paving over two left turns, banning two right turns, and threading cyclists through the middle. For pedestrians this means that crossing [A] will be shunted slightly to the east, further away from the junction, and staggered. It means a less direct walk across, which will be tiresome rather than inconvenient, with the real losers the local drivers who suddenly can't turn right any more. [B] The pedestrian crossing outside Mile End station is being moved. It's currently to your right as you exit the station, but in future will be immediately out front, where the bus stop isn't going to be any more. Unfortunately the other half of the crossing is being staggered in the opposite direction, that's further from the bus stop on the other side, so I predict a big increase in station users following a desire line rather than using the crossing. This is one of the pedestrian crossings that TfL have published timing figures for. Previously the average crossing time was 66 seconds, but by the end of next year it'll be 83. Yeah thanks for that. [B → C] Until very recently there's been a very useful central reservation running approximately half of the distance from crossing [B] to crossing [C]. But contractors are currently digging up that reservation, and when it returns it'll be both 50% shorter and rather thinner too. Indeed it's chaos between [B] and [C] at present, especially for vehicles who are being forced temporarily down one fewer lane than usual. If you were in the back of the ambulance I saw stuck here at rush hour last night, I hope you got to hospital eventually. But pedestrians are suffering too, with crossings [B] and [C] currently closed, requiring an unpleasantly lengthy detour, and crossing [D] replaced by a temporary push-button stand-in. [C] This used to be a staggered crossing, but in the new world there isn't enough room for a central island so it's being converted to a straight-across. For pedestrians, once the red man eventually goes green they'll be able to get across in one go rather than two. But with more road to cross the lights will have to hold the traffic back for longer, which isn't necessarily good news for cars, cycles and buses. [D] Much re-engineering is currently taking place here, near the girls' school, but it looks like this crossing will end up aligned much as before. [D → E] This is the longest gap between crossings along Bow Road, although at present there's a tiny traffic island halfway along. Alas that's being removed, making this the longest gap between crossings, no ifs, no buts. Expect to see more people dodging between the traffic in the future. [E], [F] and [G] are all staggered crossings and aren't changing much, although their central waiting zones will be remodelled and shrunk slightly. What will disappear is my favourite bit of central reservation inbetween [E] and [F], near Bow Road station, which currently allows me to cross the road in two parts when gaps in traffic allow. I've only got until August to make use of it. [G → H] One interesting omission in the sequence of pedestrian crossings down Bow Road is the lack of a crossing immediately outside Bow Church DLR. Lots of people exit their train and want to cross the road to catch a bus on the other side, several of whom can't be bothered to walk a minute in either direction to cross safely, so choose to risk the direct route dodging directly through the traffic instead. At present they usually end up waiting halfway in a narrow hatched zone hoping that nobody runs them over. But in future that hatched zone will be removed to make room for a bus stop bypass, leaving jaywalkers to linger on a single white line in far greater danger than before. [H] This is the crossing at the foot of Fairfield Road. Much remodelling will be taking place here to ensure that cyclists can turn off safely, plus the creation of a new right turn into Bow Road that cyclists haven't (officially) been allowed to make before. Pedestrians crossing Bow Road will have an extra slip road to cross, with a corresponding increase in waiting times, while pedestrians crossing Fairfield Road will have a signalled crossing for the first time, staggered indirectly in two parts rather than direct as now. This is one of the pedestrian crossings that TfL have published timing figures for. Currently the average crossing time is 73 seconds, but by the end of next year it'll be 98. Yeah thanks for that. [I] is the crossing to the huge traffic island containing St Mary's Church in the middle of Bow Road. The big change here is that in future it'll go straight across, rather than around the Gladstone statue, to touch down immediately before the exit for Bromley High Street rather than immediately after. That's good news for anyone trying to get to a westbound bus stop quicker, but less good for anyone heading the other way. I use this one a lot, and will be inconvenienced, so I'm intending to press the button and then walk up to where the crossing used to be to save having to negotiate an extra sliproad. And there isn't a [J], at least not yet, because [J] would be at the Bow Roundabout and that's still up for consultation. It's a miracle that anybody's thinking about [J] at all, to be frank, but currently [I] is the last safe pedestrian crossing of Bow Road/Stratford High Street for over half a mile. The whole point of the upgrade of Cycle Superhighway 2 is of course to make things much safer for cyclists, and in this respect it should be very successful. But the remodelling of the street is less good news for those of us on foot, with fewer traffic islands, further to walk and longer to wait. Indeed if the next life to be lost on Bow Road was that of an impatient pedestrian choosing to take an ill-advised shortcut, I wouldn't be entirely surprised.